The Battle of Bosworth Field fought on 22nd August 1485 was the final battle in The War of the Roses. 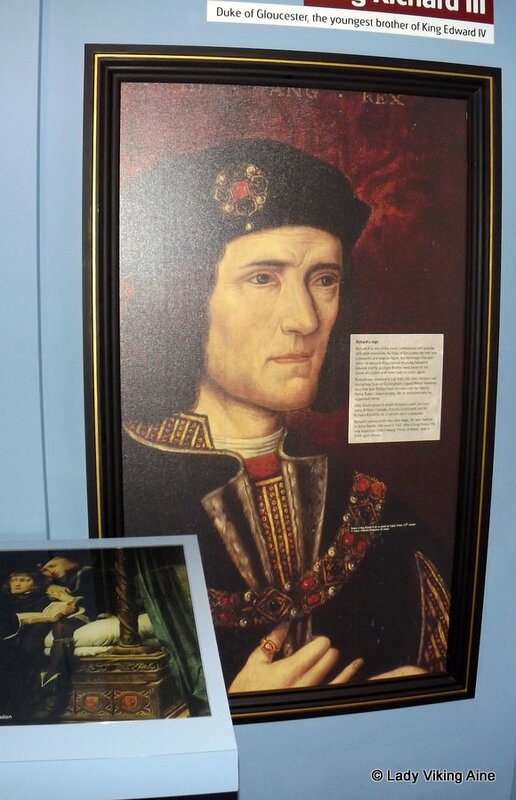 Henry Tudor faced Richard III to decide who would rule England. It signaled the end of the Plantagenets and the start of the Tudor dynasty. 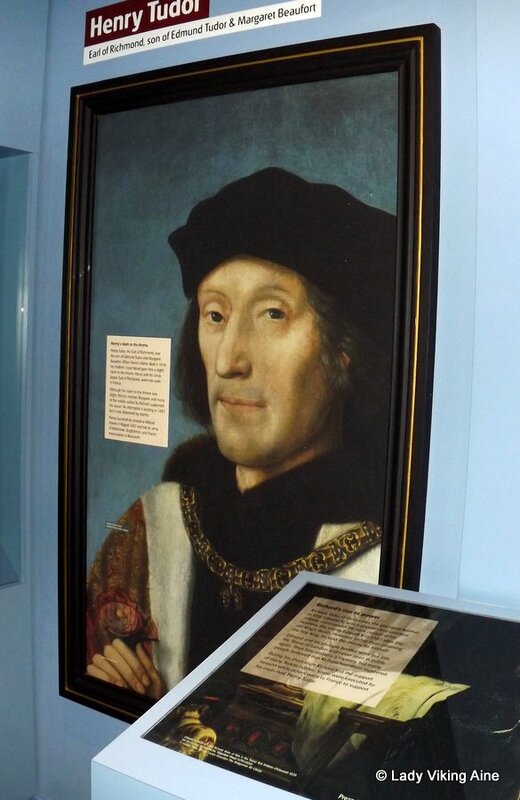 Henry Tudor, Earl of Richmond, won and was crowned Henry VII. Richard III was killed during the battle; he is the last English king to be killed on a battlefield. I’m not going to attempt a retelling of the battle and the events that surround it, but for those that want to brush up in their history you can do so here. Remember to click Next at the bottom of each of the pages to read the full story. Today there is a Battlefield Heritage Centre and Country Park just outside Sutton Cheney, Leicestershire. We visited in in May; it was a really windy day and the site is quite exposed, so we spent most of our visit wandering through the museum. It’s amazing how much can be put into what looked like a barn! The actual display is interactive and follows the story of four fictional characters and tells how they were affected during and after the battle. They are two soldiers that fought in the battle on opposing sides, the wife of one of the soldiers, and a child whose parents owned the inn Richard stayed in on the eve of the battle. Of course the main thing to so is to meet Richard and Henry. 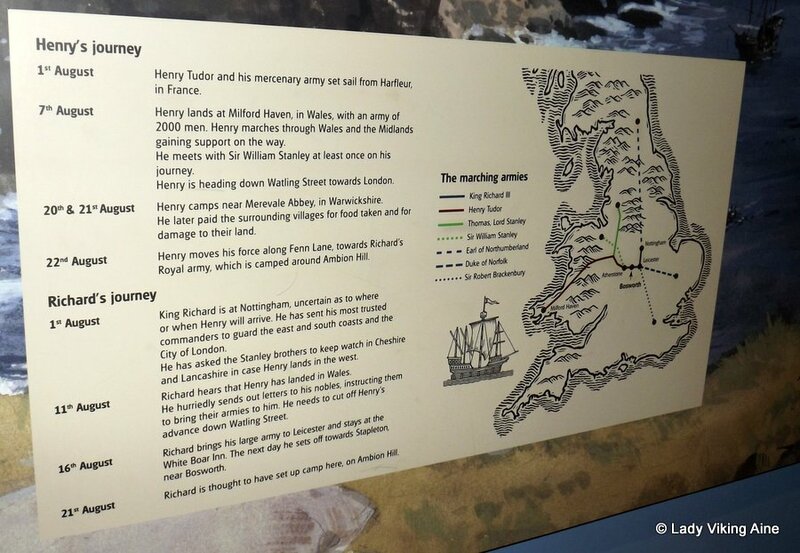 The display tells who Henry and Richard were and how they arrived at Bosworth. There is a ‘Battle Room’, with weapon and armoury displays. You can get up close and personal to these. I have to say I found the weapons very interesting. This is a period 400 years after the viking re-enactment I am involved in, so the weapons are different and the armour is much more substantial. I found the horse armour fascinating. I’ve seen pictures in books, but this was my first time seeing it close up. 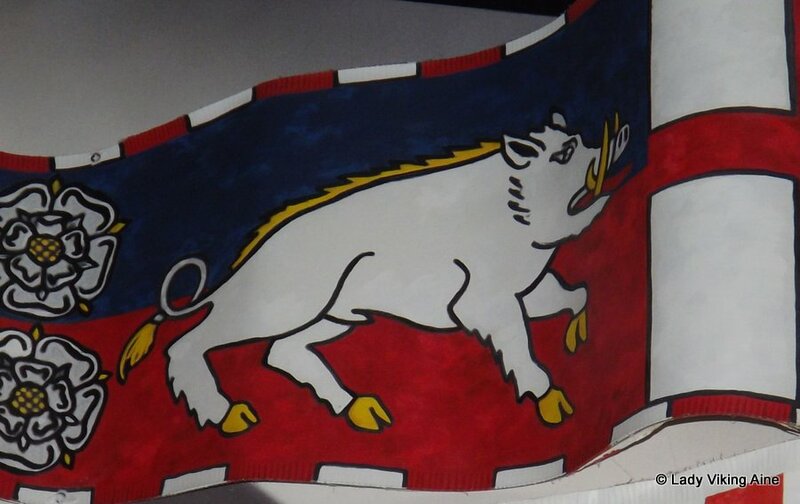 The emblem of Henry Tudor was the Tudor Rose, and that of Richard III was the Whyte Boar. 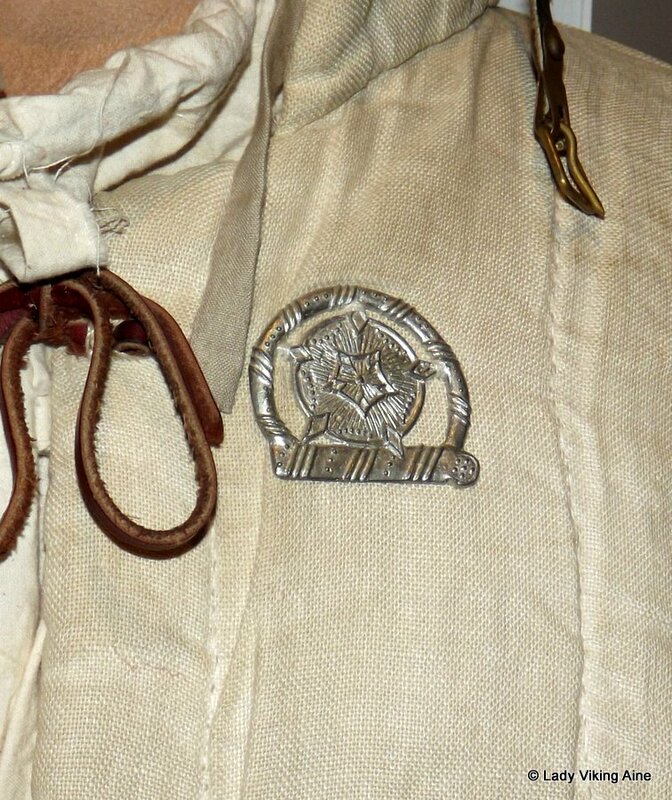 These appear throughout the display, either as banners or as clothing pins. The final stage of the exhibition is a display of ‘finds’ from the battlefield. Perhaps the most poignant of these is a little boar, most probably a whyte boar worn by on of Richard’s followers on that fateful day. This is a great exhibition to go and see, especially if you are interested in the Wars of the Roses. And visitors to the exhibition before 16th July will be able to see the face of Richard III as reconstructed by Prof.Caroline Wilkinson for the Channel Four programme ‘The King under the Car Park’. 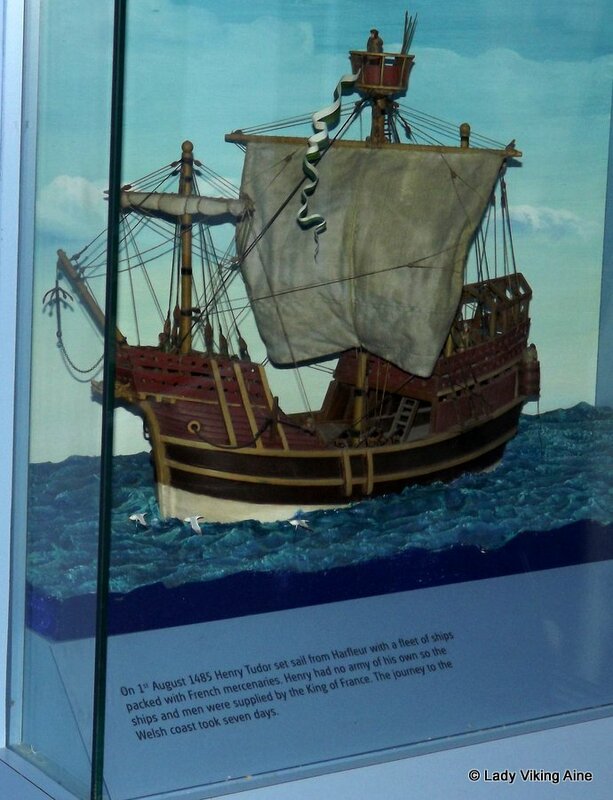 The reconstruction is accompanied by a short film on its creation and by panels telling the story of the discovery at the Greyfriars in Leicester. If you’re near Sutton Cheney this week, go and have a look! So next year will be the 1000 year anniversary of the Battle of Clontarf; you know, the one where Brian Boru sorts out the nasty vikings here in Ireland. Ed Mooney has done a lovely blog piece about the battle and the history surrounding it; it is well worth a read. There is current planning for a re-enactment event here in Ireland from the time that Boru masses his army in Killaloe before the march to Dublin for the battle, extending on through his wake in Swords Castle and burial in Armagh. It should be a truly awesome event. You can check out the current plans here on Facebook. Thanks again to Ed Mooney’s blog for this original post!